I discovered Absalon sometime ago, finding it the perfect location and environment for meetings with clients or simply enjoying a coffee and the vibe. And whilst sitting here a steady stream of Vesterbro’s locals are finding their way to this former church. Lunch is being served and the local postman is tucking away at his pulled pork. The “congregation” are a delightful mix of locals, creative dudes discussing design briefs, mothers nurturing their young ones and wandering tourists taking in the welcoming and calm atmosphere. 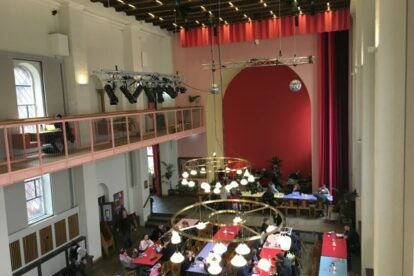 The transformation of this former 1.300m² church to a communal haven has become one of Copenhagen’s success stories. From early morning yoga to communal evening meals, the center attracts 1,000 daily guests, providing Vesterbro’s diverse local residents a social forum to interact with friends, neighbors and strangers. Before Absalon opened its doors in 2015, the interior space underwent a minor metamorphosis, with the international renowned Danish artist, Tal R creating a vibrant color scheme in contrast to the previous solemn white-painted walls – from ceremonial to informal. Today, Absalon is open from 07:00 until midnight and is a creative and social hub of activities, facilitated by 40 employees and open to all. Indeed, Absalon’s communal kitchen has become a gastronomic magnet for many of Copenhagen’s residents. Truly a communal haven.